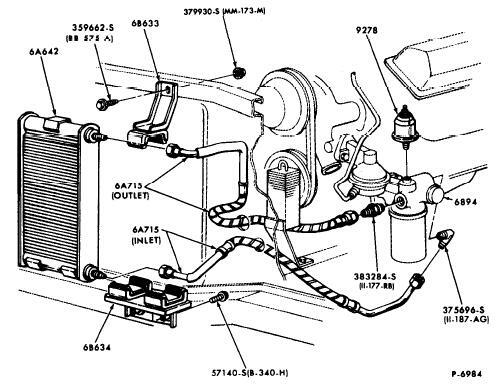 Ford identified the steel engine oil cooler used on 428 SCJ engines using basic part number 6A642. The 1975 Master Parts Catalog identifies the pump using service part number C9OZ-6A642-A. The engineering number is C9OE-6A642-B. 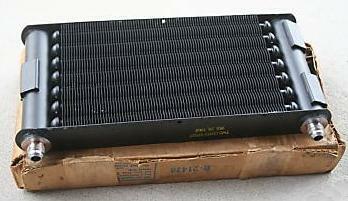 The same cooler was used on the 1969 and 1970 Boss 429, 1970 429 SCJ, and 1970 Boss 302. Cooling our big engine in a tight engine compartment was done in two phases. Our wind tunnel would allow us to run a car at ambient temps from 20 degrees F to 100 degrees F to approximate radiator sizing and fin density. Eng oil temps were well above 300 deg w/o a cooler. The requirement was to keep the coolant at least 15 deg below boil under load at 100 deg. The term Air to Boil was used - this meant the car would capable of not boiling up to 115 deg amb. We ran competitive cars also and many did not cool this well. We also had a cold room where we could start and drive the car in ambients down to minus 20 deg. Final testing was done in Kingman Arizona for cooling and Minnesota or Alaska for cold weather. I was having a ball - I had no idea how much would change with the emission programs that came at us in 1971. The engine cooling tests we ran at the Ford Proving Grounds in Arizona included standard tests such as a 60MPH road load where we would make sure the coolant met air to boil numbers explained earlier. There would also be a check at 90MPH and a 45MPH grade load test. The grade would be simulated on the 5 mile test track by having the test car tow a special truck with a 80 foot rope. This dyno truck had a large electric generator that was driven by its wheels. The load could be gradually added by raising the resistance to known values. The test car driver would just give throttle to hold 45MPH while remembering the consequences if you made a sudden stop for some reason. All drivers knew to yield to this test. Data acquisition was done manually. The front passenger would crank the thermocouple selector and read the temp shown. There would be about 45 temps taken on each lap. The recorder in the back seat would fill in the data sheets- yes, it got a little cramped in the Mustang. Transmission oil temps were obtained on an 8 mile incline near Davis Dam. A trailer was attached of the appropriate weight. This was an extreme test especially when the temps were over 100 deg F. The Mustang always struggled with high axle temps when driven hard at really high ambients. There simply was not enough air flow around the axle. I can remember the problem engineering had when we discovered the high engine oil temps running 90mph 100 degree wind tunnel tests. We tried adding fins to the oil pan and scoops but nothing worked. It took time to get the oil cooler from Karmazin packaged. I kept telling my boss this is a drag car so cooling wasn't critical. He proved to be right however as our warranty showed that some people in Texas were driving at high sustained speeds with the 4.30's and burning the engine up. So there you go - the oil cooler was needed to minimize warranty claims. As Roger noted, there's no drag racing benefit. The oil cooler is mounted in front of the radiator support on the left (driver's) side). There's normally a horn in this position. The addition of an oil cooler meant that the horn needed to be relocated to the passenger side, requiring the use of a special wiring harness and mounting bracket. Two brackets are used to mount the oil cooler to the radiator support. The engineering part number for the lower bracket is C9ZE-6B634-A; the service part number is C9ZZ-6B634-A. The engineering part number for the upper bracket is C9ZE-6B633-A; the service part number is C9ZZ-6B633-A. The upper bracket appears to have been revised over time. The 1975 MPC lists a service part number of D1ZZ-6B633-A, which corresponds to an engineering number of D1ZE-6B633-AA. The oil cooler includes inlet and outlet ports to move engine oil through the cooler. Rubber lines with steel ends and pressure fittings connect the cooler to a distinct oil filter adapter. The service part number for the lower inlet line is C9ZZ-6A715-A (engineering number C9ZE-8N039-B). The service part number for the upper outlet line is C9ZZ-6A715-B (engineering number C9ZE-8B451-B). 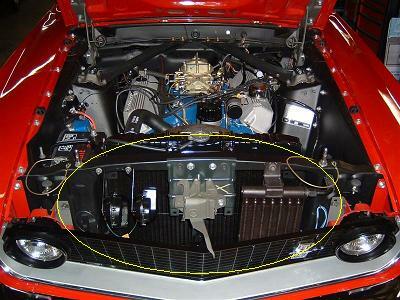 Note that different lines were typically used for the 428 SCJ when installed in a Torino or Fairlane or when the cooler was used with a 429 engine, though the C9ZZ-6A715-B outlet line was also used on the Boss 429. 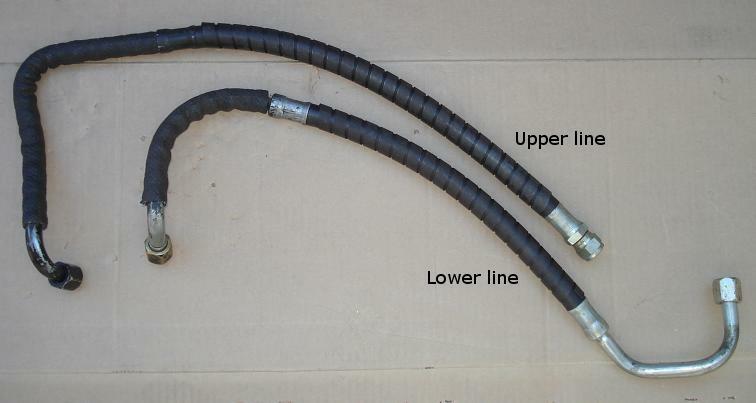 Note the long metal tube on the upper line and the "snakeskin" insulation on both hoses. The straight tube on the upper line (needed to clear the windshield washer bottle) is one way to distinguish a Mustang line from the line used on Torinos and Fairlanes.